Bin Chemiker der kein Physiker ist, ist gar nichts. A chemist who is not a physicist is nothing at all. J. R. Partington (ed. ), A History of Chemistry (1961), Vol. 4, 282. 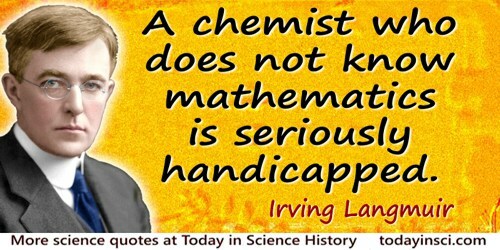 A chemist who does not know mathematics is seriously handicapped. Quoted in Albert Rosenfeld, Langmuir: The Man and the Scientist (1962), 293. 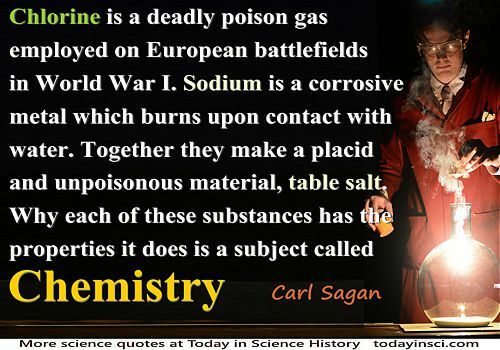 Chemistry as a science is still in its infancy. 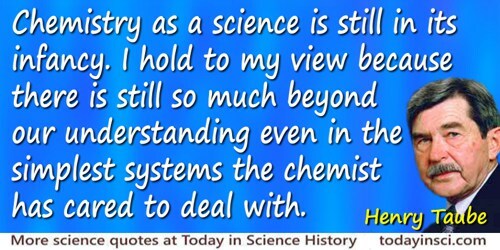 I hold to my view because there is still so much beyond our understanding even in the simplest systems the chemist has cared to deal with. Lecture at Stanford, 'Is Spectroscopy Dead? ', as quoted in Steven Chu and Charles H. Townes, 'Arthur Schawlow', Biographical Memoirs of the National Academy of Sciences (2003), Vol. 83, 202. For many centuries chemists labored to change lead into precious gold, and eventually found that precious uranium turned to lead without any human effort at all. Epigraph in Isaac Asimov and Jason A. Shulman (eds. 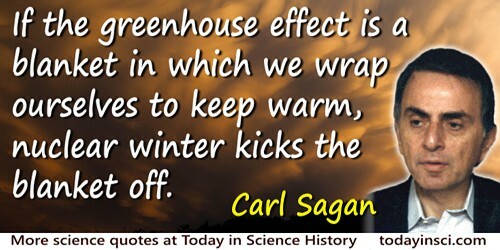 ), Isaac Asimov’s Book of Science and Nature Quotations (1988), 43. Gay-Lussac was quick, lively, ingenious and profound, with great activity of mind and great facility of manipulation. I should place him at the head of all the living chemists in France. In Mary Elvira Weeks, Discovery of the Elements (1934), 161, citing J. Davy, Memoirs of the Life of Sir Humphry Davy, Bart. (1836) Vol. 1, 469. Said to Alfred Nacquet in a debate on chemical education. Quoted in 'Berthelot', Berichte, 1908, 41, 4855. 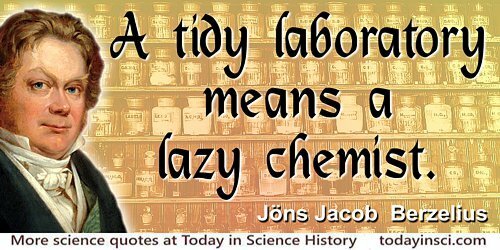 I have always had the feeling that organic chemistry is a very peculiar science, that organic chemists are unlike other men, and there are few occupations that give more satisfactions [sic] than masterly experimentation along the old lines of this highly specialised science. Henderson’s memories, unpublished typescript, 85-6, Harvard University Archives 4450.7.2. Quoted in J. S. Fruton, Contrasts in Scientific Style (1990), 194. I liked science. I wasn’t mathematically oriented, so I became an organic chemist. 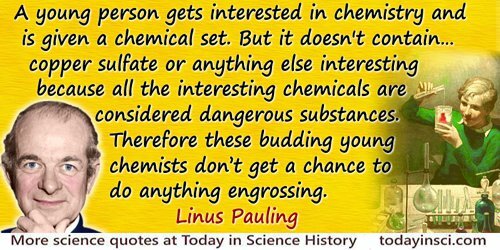 If you want to become a chemist, you will have to ruin your health. If you don't ruin your health studying, you won't accomplish anything these days in chemistry. Quoted in Berichle der Deutschen Chemishen Gesellschaft, 23, 1890. Trans. W. H. Brock. Mr Justus Liebig is no doubt a very clever gentleman and a most profound chemist, but in our opinion he knows as much of agriculture as the horse that ploughs the ground, and there is not an old man that stands between the stilts of a plough in Virginia, that cannot tell him of facts totally at variance with his finest spun theories. The Southern Planter (1845), 3, 23. One began to hear it said that World War I was the chemists’ war, World War II was the physicists’ war, World War III (may it never come) will be the mathematicians’ war. 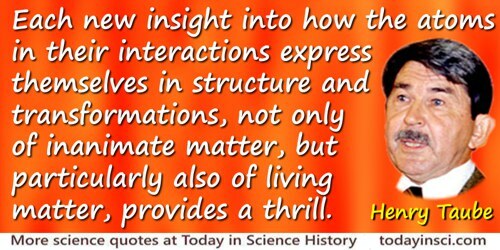 Co-author with and Reuben Hersh, The Mathematical Experience (1981), 96. One is almost tempted to say... at last I can almost see a bond. But that will never be, for a bond does not really exist at all: it is a most convenient fiction which, as we have seen, is convenient both to experimental and theoretical chemists. 'What is a Chemical Bond? ', Coulson Papers, 25, Bodleian Library, Oxford. In Mary-Jo Nye, From Chemical Philosophy to Theoretical Chemistry (1993), 261. Space … is big. Really big. You just won’t believe how vastly hugely mind-bogglingly big it is. I mean, you may think it’s a long way down the road to the chemist, but that's just peanuts to space. The Hitch-Hiker’s Guide to the Galaxy (1979, 1981), 76. The astronomer is severely handicapped as compared with other scientists. He is forced into a comparatively passive role. 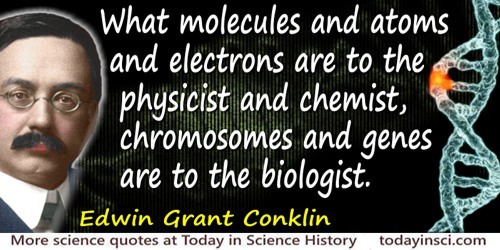 He cannot invent his own experiments as the physicist, the chemist or the biologist can. He cannot travel about the Universe examining the items that interest him. He cannot, for example, skin a star like an onion and see how it works inside. In The Nature of the Universe (1950). The chemist studies the effects produced by heat and by mixture, in all bodies, or mixtures of bodies, natural or artificial, and studies them with a view to the improvement of arts, and the knowledge of nature. Restating his own definition in fewer words, from the first of a series of lectures on chemistry, collected in John Robison (ed. ), Lectures on the Elements of Chemistry: Delivered in the University of Edinburgh (1807), Vol. 1, 11. 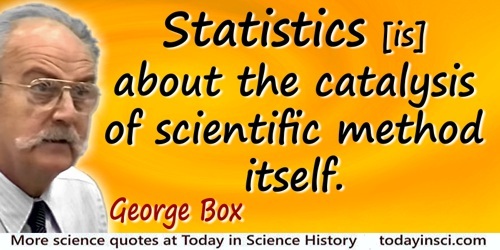 The reason that, having started as a chemist, I became a statistician was that Statistics seemed to me of much greater importance. 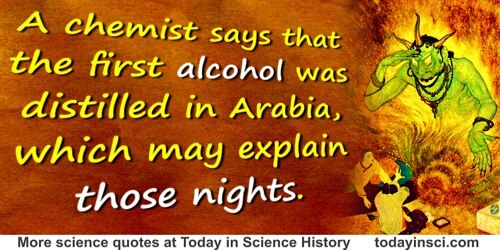 It was about the catalysis of scientific method itself. To the Philosopher, the Physician, the Meteorologist, and the Chemist, there is perhaps no subject more attractive than that of Ozone. Ozone and Antozone (1873), 1. Quoted in Journal of the Chemical Society, 1929, 6, 254. We have no knowledge, that is, no general principles drawn from the contemplation of particular facts, but what has been built up by pleasure, and exists in us by pleasure alone. 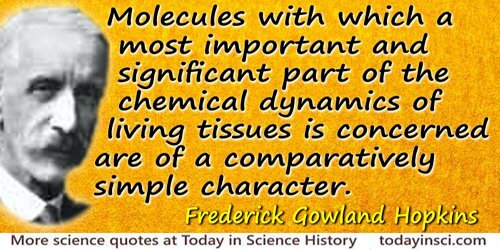 The Man of Science, the Chemist and Mathematician, whatever difficulties and disgusts they may have had to struggle with, know and feel this. However painful may be the objects with which the Anatomist's knowledge is connected, he feels that his knowledge is pleasure; and where he has no pleasure he has no knowledge. In Lyrical Ballads: With Pastoral and Other Poems (3rd Ed., 1802), Vol. 1, Preface, xxxiv. What made von Liebig and his students “different” from other chemists was their effort to apply their fundamental discoveries to the development of specific chemical processes and products. In 'The Origins of Academic Chemical Engineering', collected in Nicholas A. Peppas (ed. 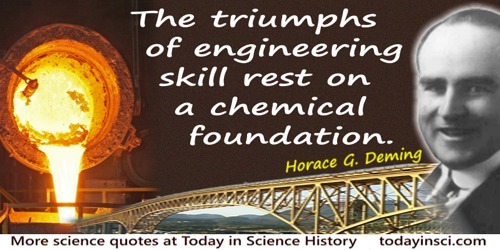 ), One Hundred Years of Chemical Engineering: From Lewis M. Norton (M.I.T. 1888) to Present (2012), 2. 'The Origin of Life: A Chemist’s Fantasy', Science Progress (1912), 7, 318.